Every day new network creators come to our platform and start their own social website. There are so many of us today that we decided to tell more about our members. 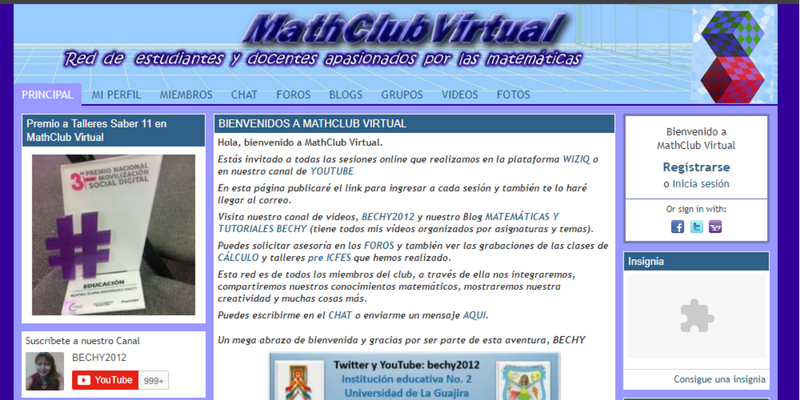 And want to share with you a story about Bechy, MathClub Virtual. Tell us a little about yourself and your community. I am Colombian, a teacher of mathematics, passionate about virtual environments to teach and learn. How did you decide to create your network? What is your community for you? MathClub was initially a face-to-face math club, formed by students of the Educational Institution No 2 in which I work. The club grew and students from other institutions expressed their desire to join. Not being able to gather everyone in a physical space, I decided to create Virtual MathClub in NING. Today we have thousands of members from more than 20 countries. For my MathClub it is my virtual house, and all its members form a great family. What can’t you imagine your community without? I can not imagine my community without the FORUMS, I love helping students who have difficulty with math or with some problem that they have not been able to solve, that is why we have several forums of advising. The first foreign member of our network was Professor Ali Amgaad of Morocco. I keep a lot of gratitude because it motivated me a lot and gave me ideas for the community. He became my best friend, although I only know him virtually. With Professor John Jairo Escobar of Ibagué, we developed a project for the learning of Multivariate Calculus which was developed in a GROUP created in Virtual MathClub, this experience was awarded by the RIBIE in the category of educational experiences in higher education. Thanks to MathClub Virtual I was selected in 2011 to attend the ICT Training for Colombian Teachers in Incheon, South Korea. I have been a speaker at mathematics conferences and educational informatics in countries such as Spain, Mexico, Uruguay, Argentina. In 2015 I was invited by UNESCO to the International Conference on ICT and Post-2015 Education, in Qingdao, China. One of the activities we do in our community is the preparation of eleventh-grade students for State tests through online workshops. Last year this experience received the National Award for Digital Social Mobilization of the ICT Ministry. Can you give us some tips how to build successful community? I think we should do everything possible to answer members in the chat, in forums and messages. Send messages to all members informing about the achievements and the new features that are incorporated. Tell us a little about your experience with NING? NING has been too important in my professional life, it has taken me further than I ever dreamed. It’s nice to be a teacher, not only of the students who assign me in the institution I work for but of thousands of students who come to MathClub Virtual in search of support in mathematics. And it is also very pleasant to meet and share experiences with professors from different countries. I want to take this opportunity to say: Thank you NING. Have something you want to share with us? Post your thoughts in comments! For those of us who may be Witches,Wiccans,Pagans,Heathens, and are seeking to network with other of like mind and interests. I have begun a new group here for us to share our communities. If your Owner or Admin on NING or and even Spruz. Click link above and add your site with a legit link and brief About. Do you believe in Christmas miracles? A creative agency from UK called Grey London definitely does. Their remarkable story tells how a seemingly crazy idea can literally save human lives, proving that funny festive trinkets can have much more power and meaning to them than it might seem from the first glance. If you have ever dreamt of having a Christmas tree right on your face, you will be happy to know that it is no longer a problem with Beard Baubles, a charity project initiated by Grey London and inspired by the magical spirit of Christmas and desire to raise awareness to the deadly illness known as malignant melanoma - the skin cancer. It all started as a mere experiment in December 2014, when Grey London and Beard Season, a charity organization from Australia, cooperatively launched an extraordinary product called Beard Baubles - a set of festive Christmas ornaments attached to the facial hair. The accessory became a true hit among the men who prefer to have a considerable amount of growth on their faces. In fact, the Beard Baubles became so popular that they were completely sold out in a very short period of time. The photos of bearded men with Christmas baubles soon flooded the internet and gave the trend an extra spin! Now Beard Baubles are among the most fashionable and fancy Christmas accessories for men and… well, hairy dogs, as reported by Ollie Dearn, who works at the Grey London agency - as it turned out, the trend enthralled not only humans but their pets too. Can beards really save people? But how do Beard Baubles save lives, you would ask. All the money from the sales of the baubles is donated to the skin cancer research. The creators of Beard Baubles believe that malignant melanoma will be combated sooner if more awareness is raised concerning this problem. Needless to say, donations are very important for fighting skin cancer, but the most important is letting more people in the world know how dangerous the disease is. That’s exactly what Beard Baubles do. The founder of Beard Season, Scott Maggs, makes the point: “The real goal of the #BeardBaubles isn’t raising funds, it’s inspiring action, and every day now, hundreds of people are signing up as Beard Season Ambassadors on our website, following us on social media, booking skin checks, and spreading the word”. Ning is always inspired by the stories like that. We know our network creators are compassionate and charitable people, who would be happy to contribute to the right cause - that’s the reason why there are so many altruistically oriented websites on Ning. To facilitate network creators in helping others, Ning has introduced a new Donations feature that allows users to raise funds for the purposes they consider important. You can now set up a “Donate” button on any page of your Ning network, provide a description of your fundraiser, explain its importance, and express gratitude to those who agree to donate. You can easily check the results of your charity campaign by monitoring the transaction statistics. So now you can come up with the idea as crazy and ambitious as the Beard Baubles in order to collect money for charity, organizations researching terminal illnesses or helping the children who lost their parents, etc. Make the world a better place together with Ning! What are the new features that will get Ning ticking again? I have some ideas sitting in cold storage since 2013. Can this Ning team take 'em up? For the fans BrainWave Fusion is destination entertainment site helping people discover new musical talent in their area and worldwide. Fans can vote for their favorite artists and even share their videos to help others discover new talent. In order to build a sustainable community, you must get to a place where your members feel comfortable and think of your place built for them when sharing that photo or tip or guide on the community you built for them. Progressive enhancement is the human way to increase relevance of your community for search engines, social graphs, bots, algorithms and yes, humans. You can do this for your community by channeling the traffic back into the network and reintroducing relevant content to those new members and visitors which might find it and the dialogue which occurs useful even, five years in the future.. I'm a little embarrassed to ask but I need to get this fixed. For sometime now we have had our blog and forum on the Main Page. I decided to remove it from the Main Page and have members click on a Tap that says Blog and another that says Forum. Well I have the tabs, the original blog and forum are stil on the Main Page BUT I just get a blank when I click on the Tab I created. I have no idea how to fix this, can anyone help me out? If you sell a product or service from your Ning Network, we invite to become a Lott-O-Luck Partner. TIP 3.0: How to change your header banner image automatically after every 20 seconds or suit to your time preference? How to change your header banner image automatically after every 20 seconds or suit to your time preference? Step 1: Create your HTML page. Sample HTML page. This page will display as a custom header banner image. Step 2: Copy and paste the following code into notepad and add your custom HTML/IFRAME page. If there is any issue while implementing this tip, feel free to ask me.